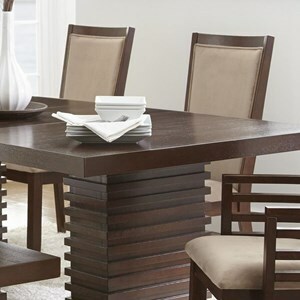 Contemporary design meets solid wood construction with a modern flair in this dining table. The twin pedestal base features solid hardwood moldings and the leaf allows the table to be extended an additional 18 inches, giving you space when needed for hosting extra guests. The multi-step, hand applied dark brown cherry finish makes the surface more durable and ready to stand up to daily wear and tear. 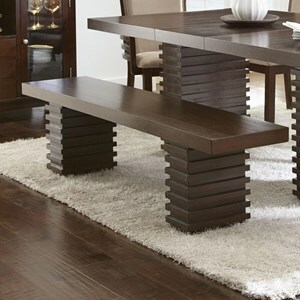 The Briana Contemporary Dining Table with Twin Pedestal Base at Morris Home in the Dayton, Cincinnati, Columbus, Ohio, Northern Kentucky area. Product availability may vary. Contact us for the most current availability on this product. BN4848T Table Top 1 42" 60" 78"
BN4848B Table Base 1 9" 18" 28"
Bring an essence of modern style into your dining space with this contemporary dining collection. 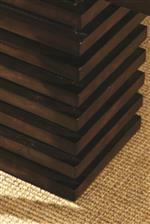 Crafted from hardwood solids and ash veneers and finished with multi-step hand-applied glaze in dark brown cherry, the clean lines and unique silhouettes of these pieces are sure to be standouts in your home. The Briana collection is a great option if you are looking for Contemporary furniture in the Dayton, Cincinnati, Columbus, Ohio, Northern Kentucky area. Browse other items in the Briana collection from Morris Home in the Dayton, Cincinnati, Columbus, Ohio, Northern Kentucky area.